DOVER TWP. – One could argue that to accumulate 700 career wins, the key element is time. That of course is an oversimplification and, in fact, far from the truth. To accrue 700 career wins in a sport like wrestling that has teams wrestle between 20 and 25 matches a year, a coach needs to have plenty of talent and success. 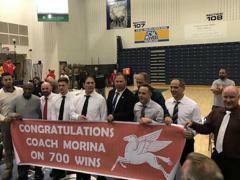 Then there is Paul Morina, who has coached long enough, had enough talent go through his program and been dominant to earn 700 victories not just win them. 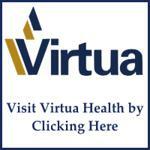 “I didn’t know how many I had until this week,” Morina said. “I never think about those things. By virtue of a 63-3 win over Kittantinny, the Red Raiders secured the 32nd Group 1 state title in program history. The win elevated Morina’s career mark to 700-43-4 easily the best in South Jersey history and second all-time in the state. For Morina, just like his 600th win, there proved to be one more thing to be proud of as his son Anthony, won at 195 pounds as his career concluded with the team – the individual tournament starts next week – with a win. “It’s all I’ve ever known,” said Anthony Morina, who was in eighth grade when his older brothers Michael and Sam were members of the program. “He’s always been in the corner. I’ve known nothing else. Paulsboro (25-1) dominated from the outset and quickly dispelled any and all thoughts of upset Kittantinny harbored. Paulsboro lost just one bout all night and the one thrilling moment came from Paul Morina’s nephew Santino, who trailed in the 182-pound match 6-5 before he turned it around for a pin in 3:20. “I enjoy this,” Morina said of coaching. “The coaching keeps me in touch with the kids. It keeps me involved. I’m not tired. I’m just as energetic and excited as I was 20 years ago. As for the future, for the first time since 2011 the Red Raiders will be missing any Morina’s or Duca’s or any of those well-known Red Raider families.